Have you ever wondered what it’s like to eat a meal without the use of sight, using only your other senses to enjoy your food? 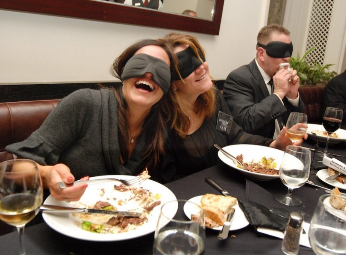 The Jerusalem Institute for the Blind will be hosting a “Blackout Brunch,” an eye-opening, blindfolded dining event on Sunday May 22, 2016, 10:00 a.m. at the Fifth Avenue Synagogue in Manhattan. Get a first-hand glimpse into the lives of those who are blind or visually impaired, while experiencing a culinary journey in the dark—relying entirely on your non-visual senses. Tickets: $90 per person until April 30, then $125 per person. Catering by Genadeen, Kashrut under the Kof-K.
Visit BlackoutBrunch.org or call 212-532-4155 for sponsorship opportunities or to purchase tickets.